I have a 2009 civic sedan with code PO847 which is 3rd clutch transmission fluid pressure switch (short or stuck on). Can anyone help me to locate this switch on the transmission. Thanks. Has it ever had any fluid changes ?? The fluid was never changed. The trans pressure switches have been a somewhat common issue across the entire car line for several years. 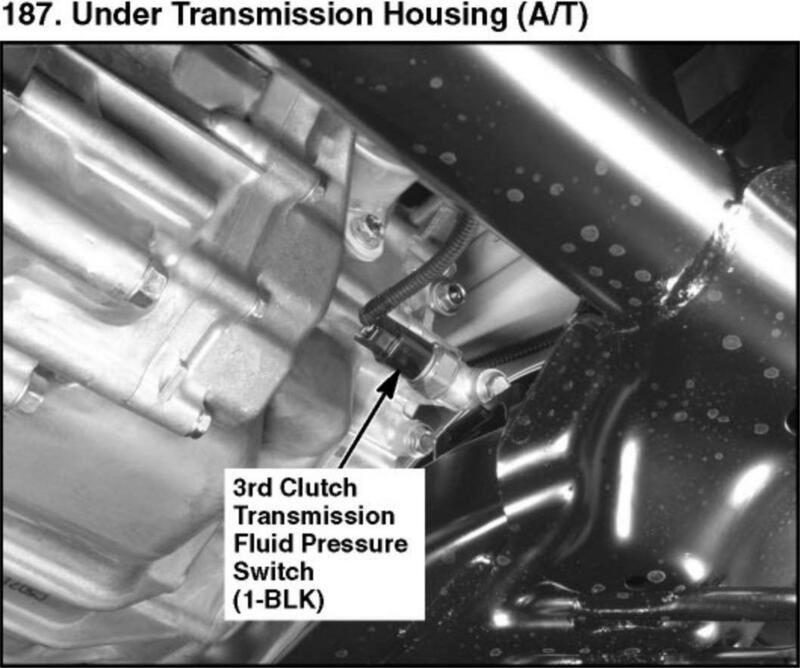 P0847 is defined as 3rd clutch pressure switch stuck ON, or wiring short to ground. It's down low on the front, below the ATF cooler. Toward the far drivers side. Single wire, black with red tracer. OP, get a fluid change, its 4 years old. It has 70,000 km. Should I change the fluid first then see what happens before I change the pressure switch? There's also another code we found. PO756. Shift solenoid valve B stuck off. Why wasn't this mentioned in the first post? Did you think it wasn't important or something? There's service info specifically addressing this combination of codes. The P0756 code can be caused by the 3rd pressure switch problem. Last edited by ezone; 09-10-2013 at 12:54 PM. I'd recommend to change fluid anyway. Use the ATF DW-1 from any Honda or Acura dealer. Drain the fluid through a strainer, see if any debris comes out. If it is clean, replace the switch. If chunks come out, then......that's a problem. I was told about the second code after my first post, so I apologise. Thanks for your help. Will post results. Hello, please i drive an Automatic Civic 2007model and the "D" light indicator blinks while driving, when i diagnosed it, P0848 was the Error code "transmission fluid pressure switch/circuit B High. please can someone show me where the pressure switch is on the type of car or is it the same as that of P0847 ? As always, certain wiring issues could cause the same codes so inspect before just replacing parts. A cut or chewed wire could cause the same P0848 code. please i was able to solve the P0848 code problem but when i was driving back this evening the gear jerked before selecting and i immediately scanned it...it displayed a P0776 code - pressure solenoid B performance/stuck off. please i need help urgently on what to so. The jerk you felt may have been the cause of the p0776 code. If the engine RPM flared during the 1-2 shift it may set the code. If a shift was slow or missed, if the two shaft speeds were not correct at the time of a shift, the computer may interpret that as a shift valve problem. So, it could be a shift solenoid valve problem, or it could be a mechanical problem in the trans, or it could be a hydraulic problem in the trans. Did you clear the code and see how it drives after that? I'm a newbie to the forum and also to the Civic world! Great to be here though. I was online searching for a solution to pretty much the same problem (error codes p0848 and p0777) and i'm glad to see an end in sight. @Niyi, please can you share how you solved the p0848 issue you had also if you've solved the p0776 error as well. Would be great to get the feedback. My car has both codes P0848 and P0777 and jerks when entering reverse and some times drive, this will continue to happen until the "D" light starts flashing and then what happens for about 5 more minutes (i think till the oil warms up) is that on trying to change to the 4th gear, the rev will spike up before the 4th gear engages. Now from what i gathered from my online research, Just like Ezone said, the 3rd pressure switch would need to be replaced but i also seem to find that i may need to replace the Transmission Solenoid as well. Hey Niyi, thanks for coming back with your update and Ezone thanks for kicking knowledge up in here. I changed my 3rd gear pressure switch this weekend and the D stopped blinking too (yaay!!) saved up to 20 times what i might have spent if i went to a mech cos it was DIY job. I also now have to use the shift lock bypass (press with slim object) to get out of park, but that most likely is a burnt fuse tied to my brake lights (which all of a sudden stopped working just after i changed the pressure switch ) . Any i'm half way thru my gear issues and thats good news....will try finding the bad fuse and replace (if any ) and also change the trans fluid and update you all. cheers and have a good week. PS...do share your thoughts everyone, on this please. If it's not the fuse, then check the brake light switch. I see them fail too. Hello Ezone, its been a while off this forum... please i now drive an accord 2003model which drags at initially piont of acceleration especially when climbing a hilly road...please what should i check? Check engine light on? Codes? Does the transmission begin from a stop in 1st gear? Which 4 cylinder engine do you have? If you are not in North America, I may not be able to offer much help to you but I'll see what I can do. I own a 2008 Honda civic lx with 97k miles. I used a code reader after I realized that my car started to kick back while shifting into 1st gear and going back to 1st gear. (Started today) Then my malfunction indicator light and the D started to flash. I'm not entirely sure if it's had a transmission fluid flush before, it hasn't since I've owned it. But the color of the fluid is a reddish dark. After using the code reader, I got the codes P0847 and P0756. The trans only struggles shifting into 1st and going back to 1st gear. Any ideas? Would appreciate the help! I got the codes P0847 and P0756. Somewhere in this thread it was mentioned the P0756 can be caused by the P0847 code. Fix the P0847 code then see how it drives. Fluid service is always a good idea if done correctly (no flush machines or chemicals), and with the correct Honda DW1 fluid. I got P0848 code on my 2008 Civic two days ago. Did a fluid change and still is in. I ordered a new switch that should be in tomorrow. Hopefully that fixes issue. Car drives fine and shifts smoothly.